Like most divers, I have vivid memories of my basic scuba training. Perhaps the most memorable is the evening my instructor showed up for class with a large bottle of Coke.® He proceeded to explain that, like the bottle of soda he held in his hands, our bodies are under pressure when diving. He made his point while vigorously shaking the familiar hourglass-shaped bottle. Then he placed it before me and asked if I would open it. I resisted, but he insisted. So cautiously and reluctantly, I removed the top, expecting a vigorous eruption to spew forth. Much to my surprise, however, nothing happened. As it turned out, the bottle didn’t contain soda after all, but food-colored water. “What did you expect?” my instructor asked, laughing. “A big mess,” I replied, somewhat embarrassed. The point of the lesson, as my instructor explained, was that while at that point we may not have known about the bends, we nonetheless understood full well the phenomenon of gas absorption and elimination in liquids — the essential concept of decompression illness. An hour later, after an informative discussion, we left the room confident of our in-depth and thorough understanding of the bends. For most divers, the ubiquitous example of bubbling soda is about as far as it goes when it comes to insight into decompression illness. But the phenomenon is far more complex and infinitely more interesting than can be conveyed by any bottle of soda, diet or regular. The first thing we should understand about decompression illness is that our body, and the way gases behave when dissolved within its tissues, is far more involved than your instructor may have implied. That’s not a criticism of your training; it’s just that given all the other vital information that must be covered, a cursory overview of decompression — the bare essentials — is all that’s possible. Besides, it’s all most divers need to know, and about as much science as most students will tolerate anyway. But for the true aficionados, there’s a whole lot more. Even the phenomenon of gas bubble formation in water is a good deal more involved than you might imagine. Because of special bonding characteristics, water molecules are very hard to separate. This gives water a high tensile strength, which is a measure of how resistant a substance is to being torn apart or separated. This characteristic makes spontaneous bubble formation in water very difficult. For example, you could theoretically compress a glass of pure water to over 200 atmospheres and immediately decompress it without forming a single bubble! The trick to avoiding bubbles is not to shake the glass as it’s decompressing. This incredible resistance to bubble formation tells us that there must be something besides supersaturation of gas that produces bubbles. The other vital point is that the water in question must be pure — free of all impurities. This point goes to the heart of one theory of bubble formation in divers. To understand what’s happening, let’s look at something that has absolutely nothing to do with diving — how raindrops form. We’ve all known since elementary school that rain comes from clouds, which are made up of water vapor. But exactly how we go from water vapor to rain is similar to how bubbles form in us. At the core of every raindrop is a particle of dust. This dust particle acts as a “seed” — a point around which the water vapor can coalesce and grow into a drop. Now, if we tried the previous experiment with a glass of water containing lots of impurities — even if we didn’t shake it — the results would be significantly different, too. Like raindrops, foreign particles in the water would seed the production of gas bubbles. Exactly how many bubbles would form depends on the number of particles in the liquid, the pressure differential and other factors. The point is, the seeds make all the difference. But what does this have to do with the bends? More to the point, what are the “seeds” in our bodies that form bubbles? It may surprise you to learn that animals, including humans, have a proclivity for creating gas “seeds,” or what are more accurately termed gas micronuclei. These are microscopic pockets of gas caused by various factors, including movement. Just as in the shaken glass, the turbulence of blood flow itself and the natural movement of the body cause the formation of micronuclei. These seeds, like the impurities discussed previously, are the precursors to bubble formation. During an ascent from depth, nitrogen diffuses into these seeds (which are actually areas of low pressure), forming tiny microbubbles. So if the lungs filter out all the bubbles, why do we still get decompression illness? There are actually two answers. First, not all the bubbles are filtered out. Exactly how this happens is still debated by researchers, although several mechanisms have been proposed. One may involve the anatomy of the lungs. This theory holds that when bubbles in the capillary beds build to excessive levels, vessels can open up, allowing some blood to bypass the lungs altogether. This bypass mechanism is called shunting and allows bubbles present in the blood to migrate around the alveoli and into arterial circulation. This is a very big problem, because the path is now clear all the way to the brain. At birth, when the newborn takes its first breath, the pressure in the left atrium increases and causes the flapper valve to close. Over time the valve normally seals shut. However, in perhaps as many as 25 to 30 percent of the population, the valve remains partially open. (The medical term is “patent.”) This allows small amounts of blood from the right atrium to seep into the left atrium. Under normal circumstances, this condition is of no consequence, because the pressure in the left atrium is higher than the right and tends to keep the valve closed. The implications are pretty obvious. Silent bubbles that develop in the venous circulation eventually make their way back to the heart. Under normal conditions, these bubbles are trapped by minute blood vessels as the blood makes its way from the heart to be reoxygenated by the lungs. As described earlier, the trapped bubbles then diffuse into the lungs, and the gas is expired in the normal respiratory process. But all is not necessarily well if you have a PFO. Under some circumstances — like when you equalize your ears — the pressure in the right atrium can increase slightly over the left atrium. It’s then possible and likely that blood will shunt from the right to left heart. This provides a pathway not only for small amounts of venous blood to bypass the lungs, but the silent bubbles contained in that blood as well. Once in the left atrium, these micro-bubbles go directly into arterial circulation. Several studies have documented this phenomenon. Yet, as research is still limited on this subject, it’s impossible to draw any solid conclusions about the implications of PFO. Nonetheless, while the PFO does not cause decompression illness, additional bubbles entering the arterial blood flow in this manner may hasten the onset of symptoms or cause more severe forms of DCI. It could perhaps even cause arterial gas embolism. One intriguing study comes from England, where a researcher examined over 100 cases of DCI. Of the test subjects who experienced symptoms of DCI within 30 minutes of surfacing, 66 percent had a PFO. In subjects experiencing symptoms after 30 minutes, only 26 percent had a PFO. This data suggests that a PFO may contribute to the early onset and severity of DCI. Understand, however, that researchers caution against drawing any definitive conclusions about the ramifications of PFOs in divers, as the phenomenon requires far more study. While certainly inconclusive, the PFO issue provides yet another reason why we should dive conservatively. The PFO issue also offers one more example of how much science has yet to learn about the mechanism of DCI. How bubbles bypass the lungs may be interesting, but that’s probably not what causes the vast majority of bends. The real culprits are the bubbles that don’t circulate, and with present technology, can’t even be detected. But the question remains, exactly how do they form? One mechanism used to explain the phenomenon has to do with the nature of the blood vessels themselves. We know that bubbles form much more easily on surfaces that are termed nonwettable, or hydrophobic (like candle wax). This happens because less energy is required to form on them than on a wettable surface. But you have to be wondering what in the world bubbles on candles have to do with bubbles in our bloodstream. Well, besides wax, another nonwettable substance is the interior surface of our blood vessels. These walls aren’t smooth, as you might have imagined, but highly irregular. They’re also made up of tissues that are primarily lipid (fat). Like a candle, this makes the interior walls of our blood vessels nonwettable surfaces. So it’s not a huge leap of the imagination to conclude that bubbles — or micronuclei — may form here as easily as on a candle. As the diver ascends and continues offgasing, the bubbles or gas seeds grow. But unlike what you might imagine from day-to-day experience, these bubbles tend not to form the familiar spherical shape. Experiments in animals have shown that they instead become elongated — a shape that increases their surface area and resistance to movement. Bubbles in blood vessels can stop or interfere with normal blood flow. This further compounds the decompression process, because it’s now more difficult for dissolved nitrogen to escape from the tissues. Some have termed this phenomenon the “bottleneck effect.” The dissolved nitrogen tries to escape or wash out, but the localized bubble formation impedes the flow of blood that would otherwise carry away the dissolved nitrogen. The nitrogen has to go somewhere, so it diffuses into the newly formed bubbles, causing them to grow even larger. It’s believed that this mechanism is a primary cause of neurologic DCI, the more serious and common form of the disorder in recreational divers. But the story doesn’t end with blood vessels. Nitrogen can diffuse into seeds between tissues. In this case, the bubbles can distort and permanently damage the tissue. As they grow, the bubbles also put pressure on nerves. This type of bubble formation is called extravascular, meaning “outside the vessel.” Aqueous (watery) tissues — the type that make up ligaments and joints — are especially prone to developing these types of bubbles. That’s one reason for the widely held theory that extravascular bubbling is the primary mechanism for joint pain, one of the classic symptoms of DCI. Another misconception that many divers have about decompression illness is that it’s all about bubbles. Indeed, bubbles are the cause, but how our body reacts to this insult is a major factor in the eventual outcome. The mechanism of DCI involves a highly complex interplay of both bubble mechanics and biochemistry. During the treatment process, in fact, dealing with the biochemical complications of DCI is as important as recompression. Research has shown that a substance in the blood called smooth muscle activating factor causes inflammation and could induce bends in decompressed animals. Conversely, a substance called anti-smooth muscle activating factor has just the opposite effect. This insight led to experiments where researchers were unable to induce DCI in animals given the smooth muscle activating factor, and the symptoms resolved once the animals were given anti-smooth muscle activating factor. These findings led to other exciting studies into the immunological involvement in DCI. Other researchers have shown that gas bubble formation brings about important changes in blood chemistry. First, the presence of bubbles in the blood activates the clotting process. Platelets — blood components responsible for clotting — become sticky, attaching themselves to each other and to the newly formed bubbles. This was the genesis of the once popular practice of taking aspirin as a preventative to DCI — a practice that is now discouraged by most diving medical experts. Bubbles also cause inflammation of the capillary walls, inducing leakage of fluid into the tissues, which contributes to dehydration. Eventually, the blood vessels themselves begin losing their integrity and start to break down. This causes the vessels to narrow and dislodges fat particles into the blood. These particles are yet another possible origin of gas seeds. Other studies have shown that bubble formation activates antibodies called complement proteins. These substances cause the release of histamines and other chemicals that cause still further fluid leakage from the capillaries into the surrounding tissues (edema). This process, incidentally, is similar to the way our bodies react when we go into shock. Amazingly, animal experiments have shown that if the release of these antibodies is stopped, the severity of decompression illness lessens. From this evidence, researchers hypothesize that a person’s susceptibility to DCI may depend on how easily his or her body releases these complement proteins. The implication of this is very exciting. Perhaps one day we may be able to develop a blood test that can identify divers who are prone to DCI. More recent studies have demonstrated that when DCI bubbles come into contact with white blood cells, the cells release toxic oxygen radicals. Their release also causes inflammation, which further slows the blood. The overall effect of all this biochemical activity is like a snowball rolling downhill. The blood thickens, becomes sticky and cannot move as efficiently through the vessels. Red blood cells now clump or “sludge” together. This, in turn, decreases circulatory efficiency and nitrogen wash-out. More bubbles form, and bubbles that already exist grow. The blood flow slows even further, and the condition gets worse. So while the decompression problem starts with the formation of bubbles, exactly how and why they form is more complex than you probably thought. Additionally, what happens after they form is almost incomprehensibly complex from a biochemical perspective. To add even more uncertainty to the recipe, very little of what you’ve just read has been definitively proven. It’s mostly informed speculation based on some preliminary experimentation and a lot of inferences based on how the body works under similar circumstances. But I, for one, am not about to buck the tide of medical opinion or speculation. If you’re smart, you won’t either. 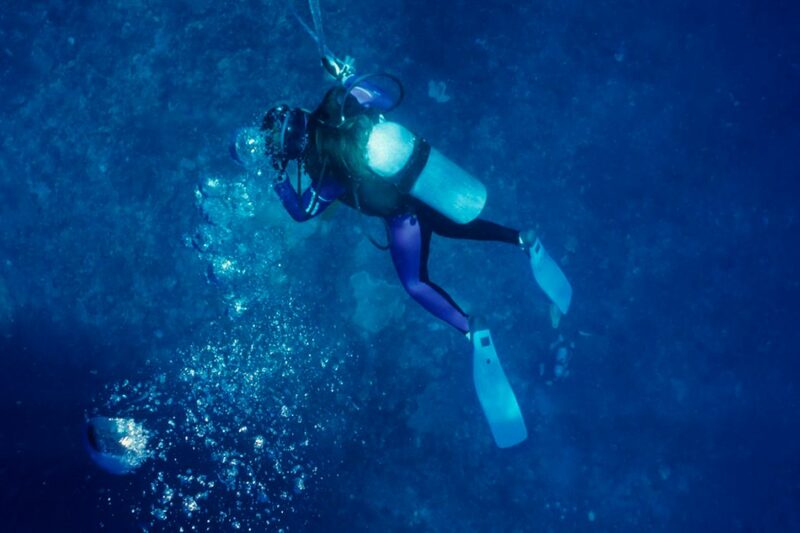 Dive conservatively, maintain good physical fitness and follow the advice of experts, and you’ll reduce your chances of experiencing a ride in a recompression chamber.